How to set up your own cricket experiment! The experiment that I have started this week uses Gryllodes sigillatus, commonly known as the decorated cricket (or brown banded cricket). I aim to look at how the ‘condition’ of an individual (more on ‘condition’ at a later date!) affects the expression of its sexual traits, and shall control this via the animals’ diet. 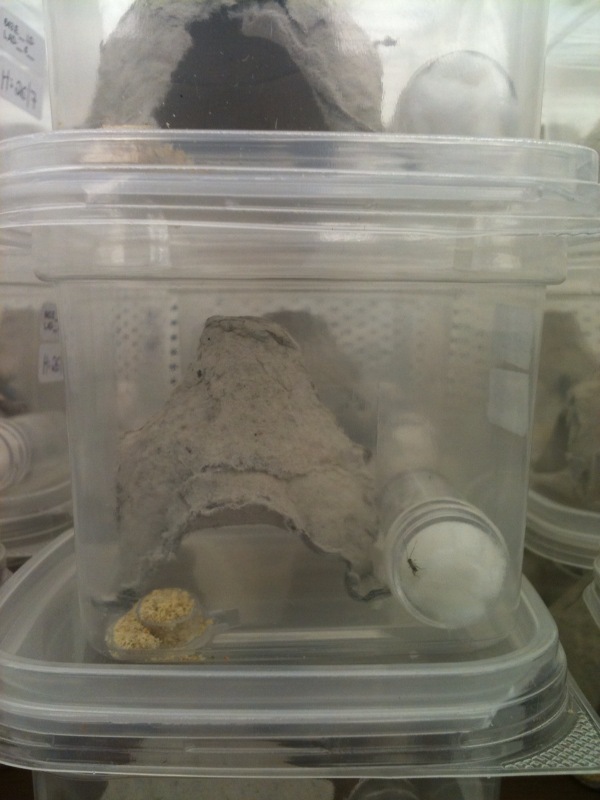 Unfortunately, these insects are quite happy to supplement their diet through cannibalising their fellow housemates (something that probably could have kept Big Brother going for another couple of series), so they have to be kept in individual containers from within 24 hours of hatching. 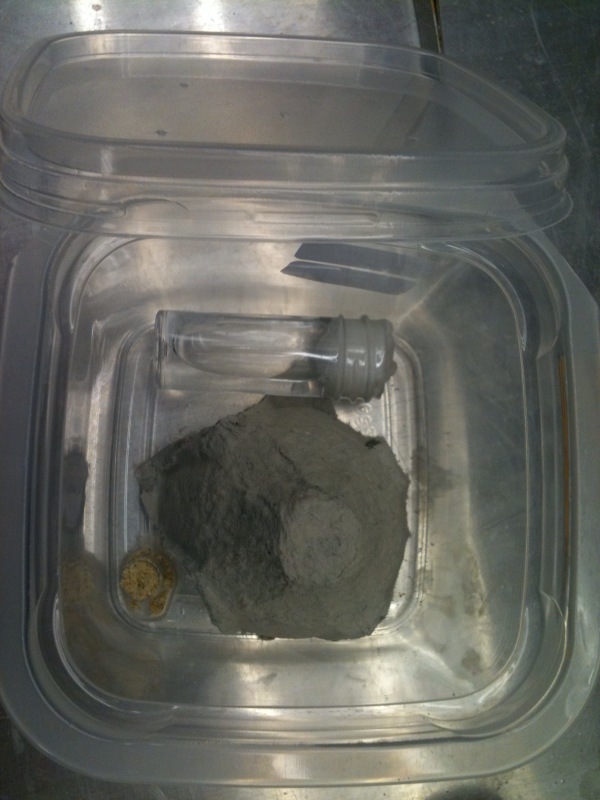 General tips on how to keep crickets at home can be found here, which you can supplement with these instructions if you wish to perform your own experiments! I am using 5cm x 5cm tubs, each of which requires a piece of shelter (one piece of egg carton), water (I use a small plastic tube with a piece of damp cotton wool as a stopper), and a food source. 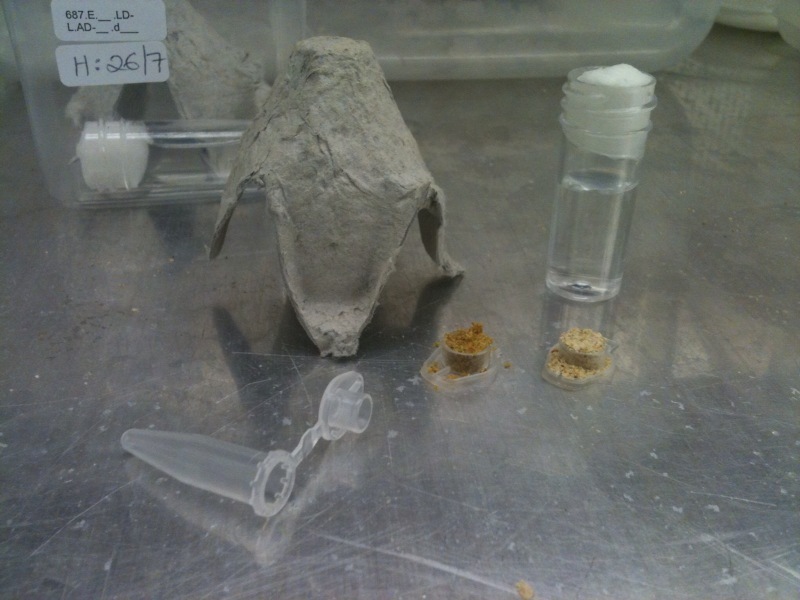 I am using the top of an Eppendorf tube to store the food, and have ground it to a powder for the nymphs – you can see an example below of the ‘good’ diet on the left (100% ground cat food), and ‘poor’ diet on the right (50% ground cat food, 50% ground oatmeal). Once the crickets reach adulthood, they can be given larger pellets – this makes it easier to control the mass of the food, as well as reducing the likelihood of the food to go mouldy! You can also see that each tub has 2 labels, one that gives information on the individual inside, and another that gives its hatch date. Once you have all your crickety needs, simply arrange in the tub as shown below! Ensure that you have pierced the lid several times before putting the cricket in there (unless your experiment is cruel and fairly redundant); you can also cut away part of the corners on the tub (as shown in the top 2 corners in the picture above), which makes it easier to remove the lid for quick access. Time will tell if this also makes it easier for the crickets to open the tub as well. Once you have prepared this little home, you’re ready to introduce your cricket babies!